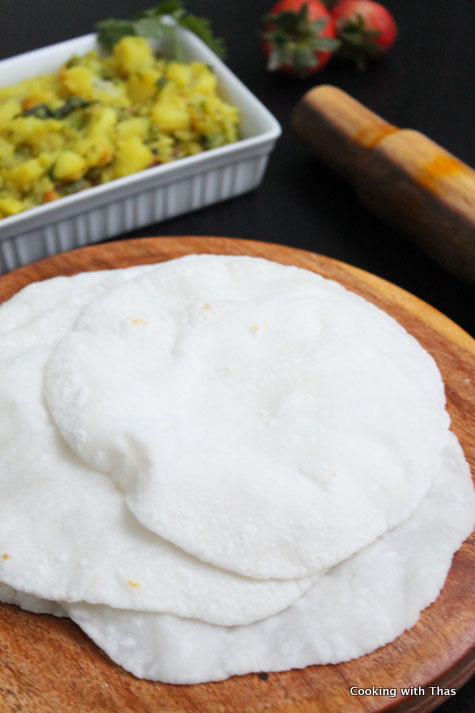 Pathiri is a traditional roti that’s popular in Malabar cuisine. These days, it is found on the menu of most South Indian restaurants. The texture of the pathiri is light and thin that almost everyone finds it hard to resist, especially when served with spicy chicken/mutton/beef or even fish curry. I love to pour some coconut milk over the pathiri, followed by spicy meat curry. It tastes divine. Pathiri and Orotti are not the same, though they are closely related. Both are made with rice flour. For making orotti, grated coconut is also added. Orotti has a thick texture and is usually prepared in orotti (tortilla) press or the dough is flattened using the hands. 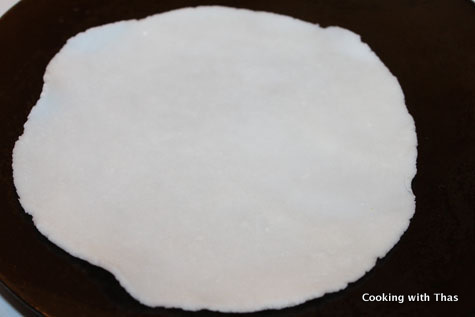 While pathiri has a super soft and paper thin texture, the dough is rolled by dusting it with rice flour to thin round shapes (quite similar to making chapati). 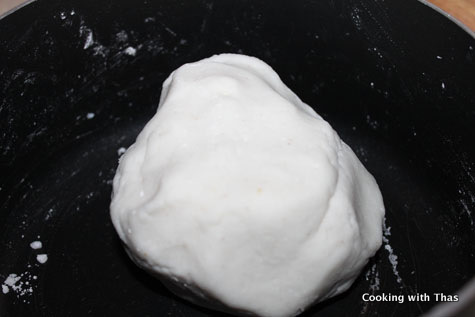 Pathiri dough should be rolled as thin as possible, otherwise it wouldn’t have a soft texture and it should puff up while cooking. Place a saucepan over medium heat, add the water. Let the water come to a rolling boil. Add rice flour and combine it using a wooden spoon. Remove from the heat and combine well till well incorporated. Close the pan with its lid and let cool down for 2 minutes. Transfer the dough to a large plate. Knead the dough when it is still warm till it’s soft and smooth- knead for 5 minutes. Very important: the dough should be warm while kneading. Make medium sized balls out of the kneaded dough. Keep the balls covered in a bowl so that they are still warm. Place the dough on a wooden board or clean countertop. Sprinkle some rice flour over it. Roll to thin round shape. 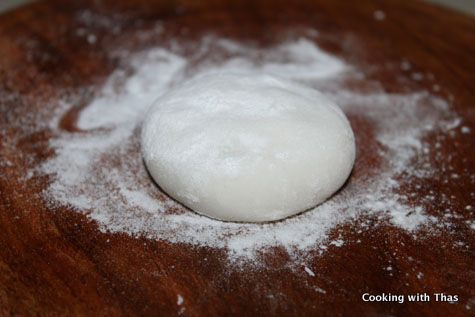 To have the perfect round shape, you could place a round lid with sharp edges over the rolled dough and press it- remove the uneven dough from the edges. Heat a cast iron skillet or non-stick cooking pan over medium heat. Place the rolled pathiri on the skillet or pan. As soon as you see some bubbles forming on the bottom side, in about 20 seconds, flip it over to the other side. Do not let the bottom side cook well. Let the bottom side get a few light golden spots, flip it over. Gently press the sides with a spatula, the pathiri will puff up nicely. 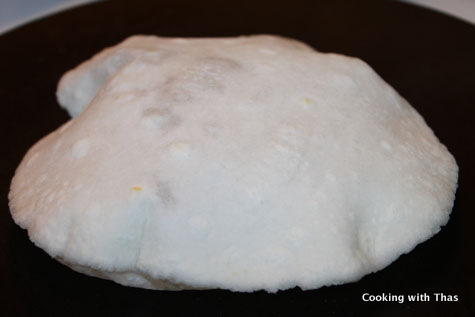 Transfer the pathiri to a plate and keep covered with aluminum foil so that it’s kept warm. 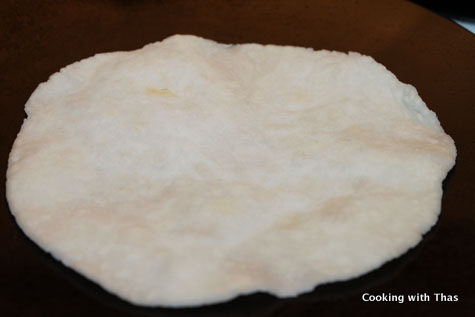 Wipe off any rice flour left on the pan before you cook the next rolled pathiri dough. Serve pathiris with your favorite curry. You could even pour some thin coconut milk along with spicy chicken curry: my favorite way of devouring pathiri. While serving for kids, pour some thin coconut milk over it and sprinkle some sugar. This tastes really delicious, kids will love it. This used to be my sister’s favorite food as a kid. Water- rice flour ratio should be perfect. It varies based on the kind of rice flour you are using. Make sure the dough is warm while kneading, and knead well till it gets soft. 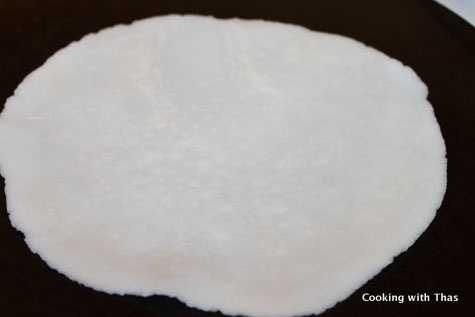 I used Double horse brand rice flour that can be used for making pathiri- it’s roasted rice flour. If you are using other brands, read the instruction for making pathiri on the back of the packet: use the water-rice ratio mentioned on the instructions. If using non-roasted rice flour, you could roast the rice flour taken in a pan till it starts to turn aromatic and light golden in color. It depends on how you flip the pathiri over while cooking. If you cook any of the sides too much it won’t puff up, it will turn hard as well. After you place the rolled dough on the pan, make sure to flip it over as soon as the bottom side starts to wilt: first flip within 20 seconds. Second flip: When light golden spots appears on the bottom side. Most of the time it will puff up by itself. To encourage puffing, gently press on the sides of the pathiri with the spatula. Remove from the heat after it has puffed up. In a saucepan, add the water. Knead the dough when it is still warm till it's soft and smooth- knead for 5 minutes. Transfer the pathiri to a plate and keep covered with aluminum foil so that it's kept warm. 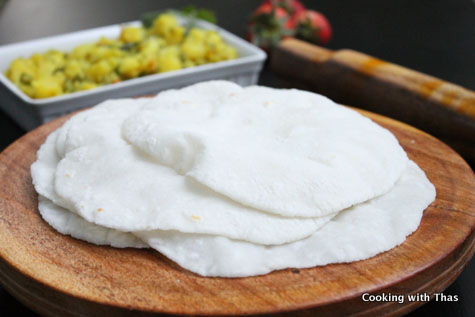 Wipe off any rice flour left on the cooking pan before you place the next rolled pathiri dough. You could even pour some thin coconut milk along with spicy chicken or mutton curry: my favorite way of devouring pathiri. 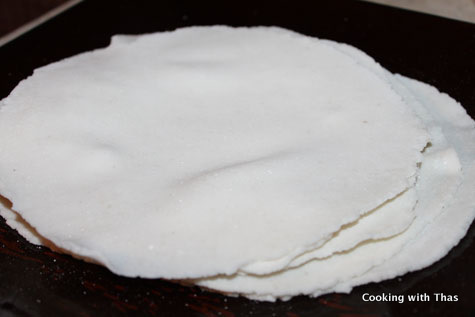 I used Double horse brand rice flour that can be used for making pathiri- it's roasted rice flour. If you are using other brands, read the instruction for making pathiri at the back of the packet: use the water-rice ratio mentioned on the instructions. roast the rice flour in a pan till it starts to turn light golden in color. It depends on how you flip the pathiri over while cooking. If you cook any of the sides too much it won't puff up, it will turn hard as well.